This article submitted by Aaron Ziemer on 7/28/99. The Paynesville Jaycees donated time this last week to repaint a building at the Paynesville Area Historical Society. The project began on Saturday, July 17, when they power washed the building with a power sprayer. Then it continued every night last week when many of the Jaycee members came by to help paint the building. 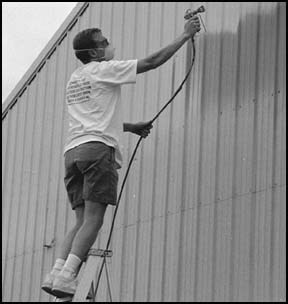 Jaycee Paul Osborne uses the paint sprayer to apply the first coat to the museum building. "It looks 100 percent better," said Bertha Zniewski, curator of the historical society. The historical society moved to their new location about three years ago, and ever since had thoughts of repainting the building. "We used 21 gallons of paint on the building," said Zniewski. Plans to repaint the historical society were being made a long time ago, when Leo Louis, alumni Jaycee, suggested they call Zniewski to hold a meeting there. She then allowed them to hold the meeting there and volunteered to give the Jaycees a tour of the museum. Zniewski said it was some time in February when she asked the Jaycees if they would be willing to help out with the painting job. The Jaycees agreed to donate their labor to help paint the building. Over the years the Paynesville Area Historical Society has seen quite a few changes. It moved to the new site, which is located in the old Benson Furniture building, about three years ago. The old location was the old Methodist Church on Highway 23. The historical society was established in 1969. On August 8, they will be celebrating their 30th anniversary. "We feel that we started at the perfect time," said Zniewski. "So many people have been so good about donating over the years." One of the reasons the historical society has been so interesting is because they put names of the people who donated the items to the historical society. Zniewski also added that the historical society has been working on appealing to a younger group of people. "The Native American display is very popular with the kids," said Zniewski. "We let them go into the teepee to touch the buffalo robe." Zniewski also said the St. Cloud Train Club has been coming to work on the model train set at the historical society. The train club is made up of fathers and sons in the St. Cloud area. Even with the painting project from the main building done, the work never seems to end for Zniewski and the historical society. "The Lions Club has helped move and paint the pioneer school in the past, and we are looking for volunteers to help paint the schoolhouse again," said Zniewski. Zniewski said they are always looking for volunteers at the historical society, and she wanted to thank the Jaycees for their support.